Today we reach an important milestone in this series. We are crossing a great divide between familiar technologies such as XML, Unicode, URI, and RDF to the Web Ontology Language (OWL). This, my friends, is where things really start to get interesting because this is the point where the Semantic Web vision really starts to take form. Today, we present a screencast exhibiting Protégé — a free, open source ontology editor and knowledge-base framework developed by Stanford Center for Biomedical Informatics Research at the Stanford University School of Medicine. In this screencast, we show you how to develop a useful Semantic Web-ready application in just minutes. You will learn how to model a very simple ontology in OWL (the Web Ontology Language). We're still using Protege, but this time working with the new ALPHA version and getting deeper into concepts. In Part 1 of this series, we introduced the Semantic Web vision set forth by Tim Berners-Lee. We also took a look at the famous layer cake diagram illustrating key technologies that make it possible. 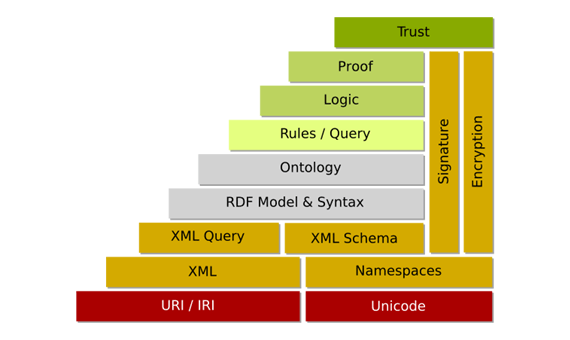 This week, we'll be munching around the bottom of the layer cake with a few important points about Unicode, URI, and XML. Below, you may notice that we are presenting a slightly different illustration of the layer cake than last week. The intent is not to confuse you, but rather to point out that there are a variety of interpretations floating around the Web.